Historically, common boneset has been used to treat a number of illnesses. This has led to a number of different common names including thoroughwort, sweating plant, and wild Isaac. This is a rather large plant, often reaching four feet tall, and one that spreads by rhizomes to create colonies. These attributes may be a deterrent to many casual gardeners who like to keep their flower beds neat and tidy. But for those who are looking to attract butterflies and other unique pollinators, common boneset is a plant that deserves serious consideration. 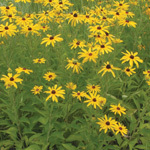 It's nectar-rich, fragrant flowers are sure to attract monarch butterflies that are passing through. The caterpillars of several moth species feed on the plant. Seed: Will benefit from 30 days of cold moist stratification.